There was perhaps no greater collection of advanced technology packed into a smaller space than the hydrostatic capsule, a marvel of physics and chemistry that not only managed a starship pilot’s every biological need, but shielded him from the rigors of interstellar travel as well. While immortals navigated among the stars in blissful comfort and perfect awareness, the unfortunate souls riding in their cargo bays were not so lucky. With only a hint of a thought, the capsuleer opened a communications channel between his pod and the personnel module locked securely in his vessel’s cargo bay. “I don’t have time for this,” he warned. Without another word, the capsuleer hurled the module out into space. The moment it cleared the ship’s cargo bay, all artificial gravity abruptly ceased, sending him sprawling sideways through the void to slam into what had once been the ceiling. His consciousness returned to him in pieces, foremost the sensation of being hauled up into a chair. After that, it was the sound of thickly accented Khanid voices talking about dosage levels and heart rates. Finally, his vision focused enough to recognize the cold, impartial décor of a medical bay and two technicians who refused to look him in the eye. A low-pitched chime caught their attention and they turned to face the door as it opened. Moving with something halfway between a regal slide and a martial strut, the ship’s captain made his way to stand over the captive. Two armed marines in sleek, copper-colored body armor took up positions inside the doorway, rifles clutched to their chests. “Fugitive Ankarrek,” the captain began as he adjusted the top button of his uniform’s collar, “you are wanted throughout the Empire for the murder of an Amarr holder.” The normal pause between accusation and a presumed rebuttal was omitted entirely. “The reward for delivering you alive is twice what I’ll get if you’re dead. Pleasant dreams.” He nodded to the doctors as he made his way back out of the room. The marines remained. After a few excruciating minutes, one of the medical technicians turned around slowly, concentrating on the syringe she was coddling. Errus panicked and began writhing against the flexible straps that held his wrists down firmly against the chair’s armrests. In just a few seconds, his bony, thin wrists were bleeding. When the doctor reached out for his arm, it suddenly slid away from her and out of the grimly lubricated restraint. In the time it took Errus to lash out and grab at her, the two marines had already raised and fired their laser rifles. The first shot seared a crater into the doctor’s back, killing her so quickly she only got out half a scream before a puff of smoke drifted from her nose and mouth; her lungs had been incinerated. The second shot lanced under her arm, burning a line through Errus’ hip a few centimeters deep before igniting a compressed gas cylinder on the wall behind him. There was a brief, high-pitched whine before the container ripped open and blasted its contents out into the room. Errus was sent sprawling forward, the doctor’s limp body twisting away from him. The other doctor was hurled back against the instrument panel, the back of his head smashing a terminal monitor and leaving a trail of blood as he slid down into a lifeless slouch. Staggered but otherwise unharmed, the armored guards immediately began scanning the room for their target. As the haze rolled in around them, they found it impossible to penetrate the cloud of hot chemical vapor with their visual and thermal scanners. One nodded to the other, who removed his helmet with a quick, practiced twist at the neck seal. When his rifle was ready again, the second marine did the same. He looked back to confirm he was ready, which was exactly when Errus appeared behind him. Wrapping one arm around the guard to brace his attack, the fugitive slammed the syringe directly into the soldier’s neck, pumping his bloodstream full of sedative. Without hesitation, the other marine fired again, but the beam lanced into his partner’s shoulder — fortunately, where the thick ablative armor plate could absorb most of the laser’s white-hot impact. Errus shoved the unconscious body forward, sending both marines to the floor in a jumble of armor and weapons, after which he leapt atop them and struggled to wrap his hands around the second marine’s head. Pinned by the extra weight, the marine was unable to defend himself. His neck snapped sideways. Only then aware of the warning sirens blaring overhead, the bruised and bloodied former slave stumbled into the corridor outside the medical bay. 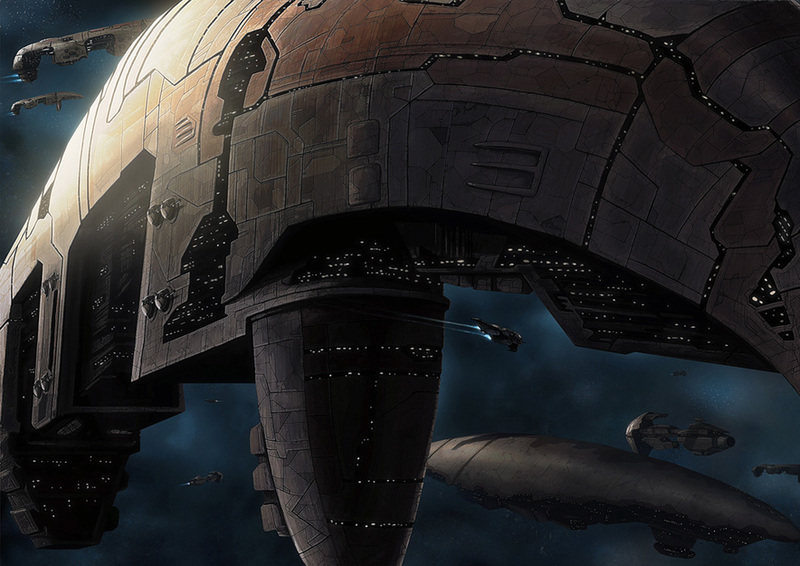 He limped along through several intersections in the twisting labyrinth of tunnels that made up the lower decks of the Amarr battleship, somehow avoiding emergency crews and marine squads until he came to a row of circular escape hatches. Twisting one open and ducking inside, he spent a few seconds wondering if he should stay aboard and try to slink away when the ship docked, but fear and adrenaline got the best of him and he stabbed the activation button. “Lock target and fire.” Leaning forward in his chair, the captain rubbed his neck as he waited for an update. “Then calculate its trajectory and charge up the main battery,” the captain growled. “The moment it hits the ground, I want you to dig him a grave half a kilometer deep.” The rest of the crew of the command deck exchanged nervous glances at their commanding officer’s brief slip of composure. By then, the captain was almost visibly fuming. “What of it?” Not waiting for a reply, he snapped around to his weapons officer. “Fire when ready, Sergeant.” But the gunnery sergeant simply glanced back at the political officer, a gesture that pushed the captain over the edge. “Prepare to fire, dammit!” He rose from his seat, but before he could reach the weapons control terminal, the telltale squeal of a holdout laser pistol’s capacitor charging up stopped him. “Not one more step, sir,” the stocky, bald government representative scolded as he idly tapped the weapon against his thigh. “This is my ship, and I’ll do whatever it takes to—” was all he got out, because halfway through the sentence he took one more step and the political officer fired, the brilliant lance of golden energy coming close enough to the captain’s head to leave a thin burn mark across his cheek. He stood there, paralyzed with his eyes wide open, as the political officer stared down the smoldering barrel at him. “By the authority of the Imperial Chancellor’s office, I hereby relieve you of your post. The command you just tried to issue was an act of high treason. When Errus crawled out from the damaged but intact shell of his escape pod into the howling, abrasive wind that screamed over the barren world of Arzad II, he saw the shimmering azure contrail of the starship streak to the horizon as it entered warp. Dazed and bleeding, he stumbled for a few kilometers, convinced each step would be his last, before the ground in front of him suddenly sloped down into a massive, almost perfectly straight canyon. From end to end, it was completely filled with a shantytown constructed from scavenged sheet metal and other refuse. The last of his strength barely allowed him to shuffle down the side of the crater and reach the edge of the sprawling city. It only took a few minutes for a passing child to notice the unconscious body slumped against an empty fuel barrel. When Errus opened his eyes again, still exhausted and light-headed from blood loss, she was crouching in front of him, staring intently. For some reason, his eyes focused on the tattoo on the side of the young Brutor’s neck — in the shape of a wicked, curved slaver hound fang. “Who are you?” He struggled to sit up straight and noticed other Minmatar emerging from nearby buildings.